These just KILL me. Grellow is here to stay!!! Sometimes a captivating design idea hurtles from left field. Like this. 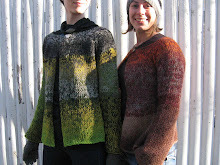 The pattern will be called GO DUTCH. I'll be getting down to work this very evening. 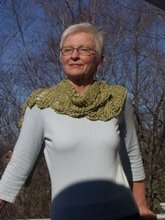 ... as well as my Danish Tie Shawl, instructions for which can be found in Spin Off, Spring 2008. 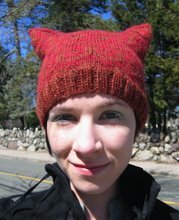 My second knitting resolution for 2010 (the first is to learn new techniques and challenge myself) is to knit simple things that I'll wear all the time. Finally, there's the work pile. 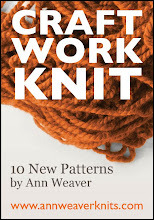 I've decided to do a collection of patterns as an ebook, which I hope to release in the early fall. 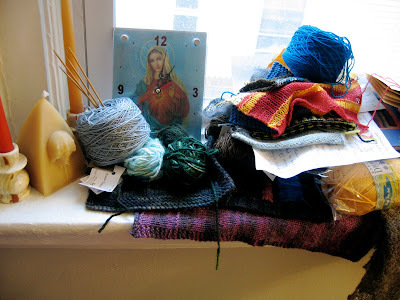 It's going to be epic, with at least two cardigans (sized for 32 to 54 inch bust) and two sweaters (again, sized for a very large range), as well as accessories. It will be a fabulous value. It will be off the hook. It's already off the hook! Who wouldn't want all this??? I quit my job the other day. Things were, um, unpleasant there. However, I'm going to continue baking bread (it's nice to leave the job but not the entire job category for a change), and will be starting at a new bakery within the month. 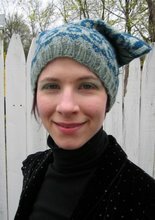 Earlier I mentioned that I'm reworking a lot of my early published patterns to make them consistent with my newer ones (lord, was I blathery in some of those early attempts)... the most recent revision is the Nouveau Sack Hat, now available through Knit Picks for $1.99. 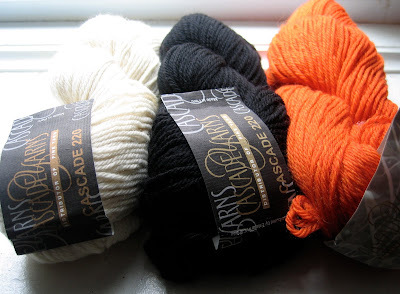 I used Andean Treasure yarn, an awesome alpaca for the price. The main color, Midnight Heather, is much more multifaceted than any of the photos demonstrate; I constantly held the ball up to the sun to peer at the colors which working with it. Photos? Here ya go! Photo on me at home (wearing what? Seriously, I think I took this photo against my bathroom door on my way into the shower). So now you can download your copy for $1.99! 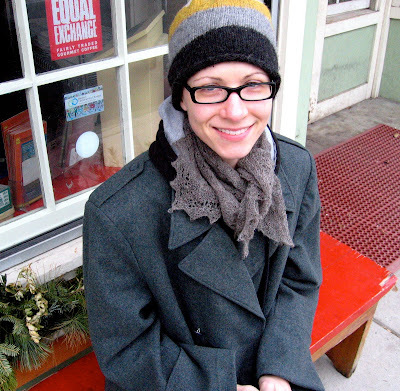 Next up in the old pattern revision plan: Lauren. Be warned: The price of the pattern will be going up from $3.00 to $5.00 after revision, so if you want your $3.00 copy, get it within the next few weeks! 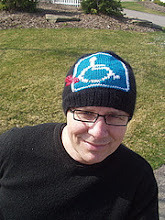 The new version will be improved, but if you buy now, I can and will send you the revised version as soon as it comes out (Ravelry has a feature for this). P.S. 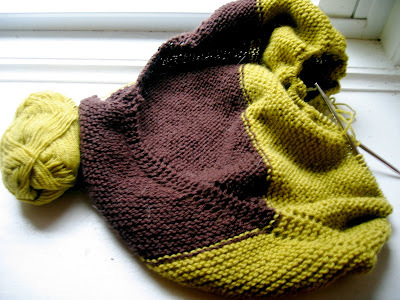 The Lauren I'm knitting right now is in Malabrigo Frank Ochre, the favorite of all my favorite grellows. King of kings in the land of yellowgrellow. 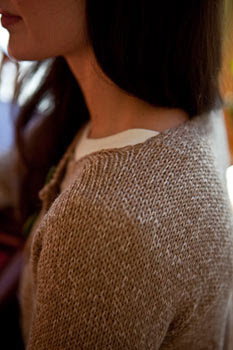 Interweave Knits Spring 2010, fo sho! Dude, I've been making a lot of stuff. Here's a design I worked up for IK in a color that I initially hated but that ended up growing on me. A little. Anyway, I was worried they would photograph it on a model wearing an apron, holding a cup of coffee, and/or walking through a field of flowers, so I took a few photos of myself wearing it in my work clothes to show that it's wearable by normal people who are going to work, not frolicking in the fields. 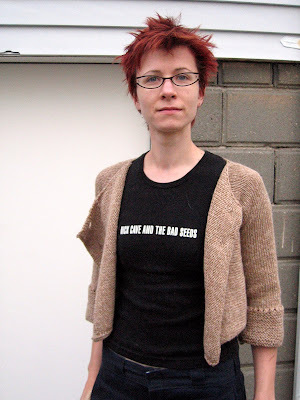 Now you know you can wear it with your Nick Cave t-shirt and look great! My worries were overblown, however. 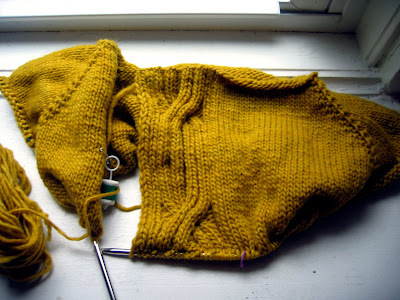 IK did a nice job with it, really showing off the simple construction a the neatness of the neckline. Check out more of the preview here. On the stands March 2! 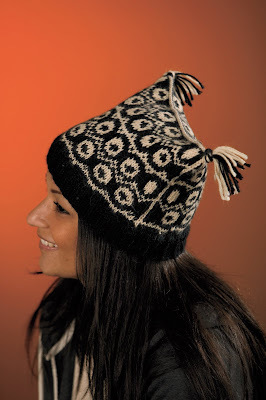 Make one in tweedy wool! 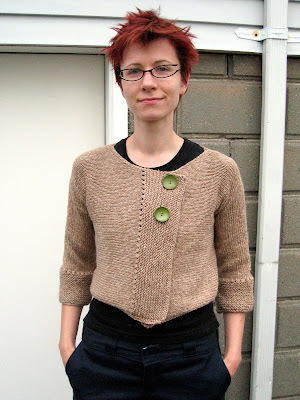 Make one in acid green cotton! 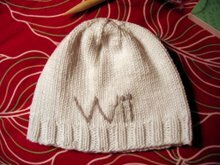 I'll make one in navy for my sister! Behold! 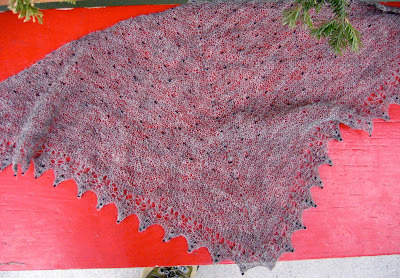 A blocked and worn shot of the Emily Dickinson Shawl! I knew it would look good with army surplus/Dickies hoodie. 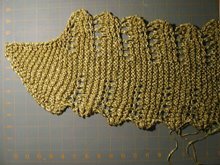 On the far less complicated end of the lace knitting scale, I have reworked the pattern for Reptilian, my very first published pattern (summer 2007, I believe), after reknitting it in Habu soft wool 2/7 with black beads left over from Emily Dickinson. 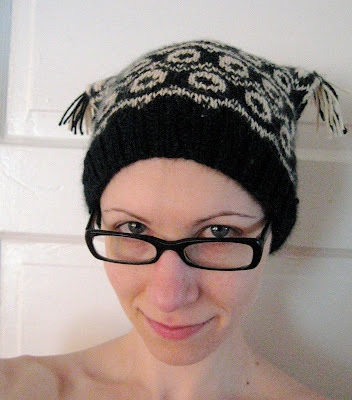 It's knit on size 11 needles in any yarn you like and took me 2 days of not very intense knitting. 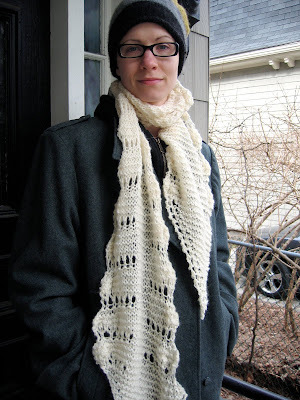 You can download the updated pattern for free... download now!